There are some who remain unaware of this truth. Instead they rely (through no fault of their own) on hand-me-down traditions that speak of ruining whiskey by adding water. I’d like to address this belief and set the stage for future articles in this series. Today, we’re going to talk about why this idea exists, and what reality is. Where does the idea that water ruins whiskey come from? This idea usually comes from two different groups: The Purists and the Provers. The whiskey Purist says adding anything to your whiskey ruins it. That if you want to drink whiskey the right way, you drink it how it comes from the bottle. No mixers. No ice. No water. One motivation for this line of thought is appreciation. The whiskey Purist loves whiskey, and they feel that adding water to what the master distiller bottled is like telling a master chef his soup needs more salt – no appreciation. Another motivation for the whiskey Purist is wanting to taste the whiskey in its “pure” state. Adding water would ruin the experience. This type of person would be horrified if you put A-1 on their steak. Are they right? We’ll see. The Provers say that real men drink whiskey neat. To the Prover, adding water to your whiskey is drinking it the “sissy” way. They don’t add water to show their manliness. Put water in your whiskey around a Prover and you’ll probably be asked, “What, can’t take the burn?” This type of person uses extra hot hot-sauce because they’re tough. Is the thinking of the Purist and Prover compatible with reality? Let’s take a look. Does adding water to your whiskey show a lack of appreciation for the distiller’s genius? Maybe not. The question is, what were the distiller’s intentions for the whiskey? Does every distiller intend every whiskey to be sipped neat? Do distillers only drink their creations sans water? No way. The reality is most distillers try their whiskey neat, and they try it over ice, and in a cocktail, and with water. Why? Because they want to make sure you’ll enjoy their whiskey any way you have it. So go ahead. Appreciate your whiskey the way you like it, guilt free. It’s allowed. Does adding water to your whiskey ruin its pureness? While it’s true you can have too much of a good thing, adding a little water to your whiskey won’t ruin its pureness. Why? Because most bottles of whiskeys are over half water. When a whiskey comes out of the barrel it’s usually too high in alcohol to be enjoyed. So what does the distiller do? They add water to bring the whiskey down to a drinkable level. But wait, what about the whiskeys that are uncut and unfiltered that come straight from the barrel? Those are pure, right? If your definition of pure means “no water” then no, those aren’t pure. They have water in them. Water is in every part of a whiskey’s life. From cooking the mash, to the distiller’s beer, to even what comes off the still, water is in there. In fact, if you made a 100% pure ethanol distillate – which is impossible by the way – then by definition you wouldn’t have whiskey anymore. So add some water if you like. You’ll still be drinking pure whiskey goodness. Does adding water to your whiskey mean you’re a “sissy”? I feel like this doesn’t deserve a reply, but here we go. No, it doesn’t mean you’re a sissy. Why? I actually don’t have a scientific or logical line of reason for this one. I do, however, have a strong opinion. There are a multitude of other ways to show that you’re “tough” or “manly.” I believe whiskey is meant to be enjoyed, and is not a proving ground. If adding water to your whiskey increases your enjoyment, then add water. For those who feel the need to prove something, they can do push-ups over there while you and I savor our whiskey. 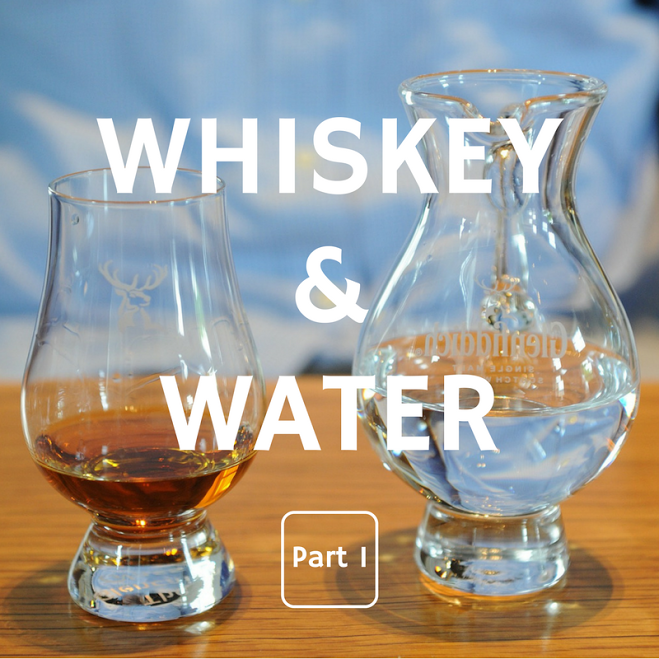 Now, we’ve got that out of the way, what actually happens when you add water to whiskey? We’ll answer that in part 2.